The independent transport videos cameras first made a visit to San Francisco in 2007. We returned in October 2015 to catch up and see how the transport scene had changed. There was so much to see we have had to put our results on two DVD programmes! The Historic Streetcars, Trolleybuses, Light Rail, Cable Cars and Buses are controlled by the ‘San Francisco Municipal Railway’, known as the ‘Muni’. 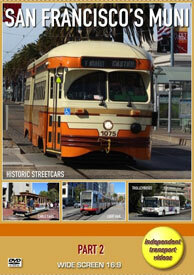 These two programmes major on the Streetcars, Trolleybuses, Light Rail and the Cable Cars. During our filming, San Francisco was hosting ‘Fleet Week’, a US Navy event that featured many US warships and the US Navy’s ‘Blue Angels’ air acrobatic team. They can be seen and heard practicing their displays – adding a new dimension to our programme! However the stars of the show must be the superbly turned out Historic Streetcars. These trams, mostly PCC cars from the late 1940’s are each painted in a tribute livery to the towns and cities where they would have previously operated across North America, Canada and Mexico. There are also some Peter Witt trams from Milan, Italy representing three of their liveries. They all operate on the F-Line all week and the double-ended PCC cars on the E-Line at weekends. Part two of our programme begins on board Peter Witt, Milan tram 1859 at Fisherman’s Wharf. We make the journey along The Embarcadero on the F-Line route to the Ferry Building at Ferry Terminal on the morning of Saturday October 10th. At the terminal all the trams are being held, unable to travel along Market Street due to the visit of Barack Obama, the President of the United States, whose motorcade was travelling along. This gave us a superb opportunity to film a vast amount of streetcars waiting their turn to complete their journeys toward Castro! From here we continue along The Embarcadero towards the Caltrain Depot. This line is used by the E-Line Historic Streetcars and the Light Rail cars. We also get a glimpse of some of the US warships in harbour for the ‘Fleet Week’ celebrations. On Townsend and 3rd Street we catch up with some trolleybus action and on King and 4th Street we see the double-ended PCC cars running the E-Line service. Here we join PCC 1008, often referred to as a ‘Torpedo’, for a ride to the Ferry Terminal. On leaving the tram we hear and see the ‘Blue Angels’ in action as we head to Market Street. We now have some night-time views of cable cars and streetcars at the Ferry Terminal. Back in town on Market Street we ride on PCC 1052 to the Ferry Terminal and then ride cable car 50 on the California Street line to its terminus at Van Ness Avenue. Here we have some trolleybus action. We ride on trolleybus 7127, an articulated Electric Transit Inc. 15TrSF vehicle to North Point Street. Here we see the trolleybuses turning at this busy terminus. Our cameras then board trolleybus 5548 an ETI (Škoda) 14TrSF and travel back to Market Street. We then visit the Castro F-Line terminus at 17th and Castro Street and ride PCC 1079 the full length of the F-Line to Fisherman’s Wharf. Our penultimate scenes are on The Embarcadero at night-time where we have a lovely surprise! We film former Blackpool Corporation Boat 228 on a special charter! Our final ride back to Fisherman’s Wharf is on board PCC 1075. We do hope that you have enjoyed your visit to the San Francisco Muni – we certainly did!